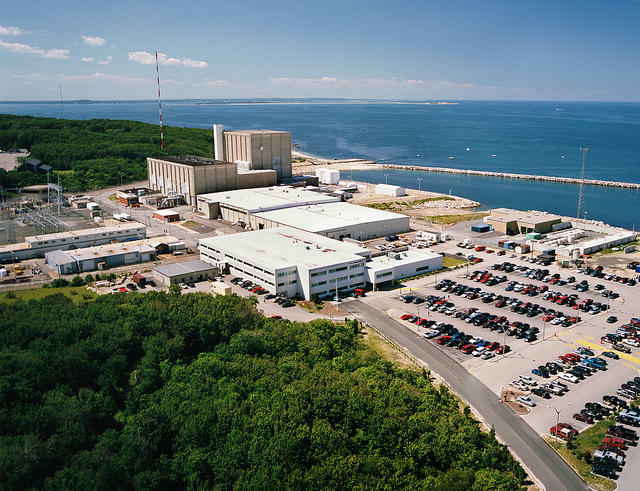 The Pilgrim Nuclear Power Station in Plymouth is no longer designated as one of the country's worst performing powerplants, according to the federal Nuclear Regulatory Commission (NRC). In the Commission's most recent assessment report, it states that the plant has met all outstanding safety concerns. "This is big news for us," said Patrick O'Brien, spokesman for Entergy, the owner of the plant. "It’s really a point of pride for our workforce. The 600 people, our men and women, have really committed themselves to turn around performance, pushing to get back to the top and Column 1." Since 2015, Pilgrim has been designated by the NRC as a Column 4 plant, for its history of repeated safety violations. Column 4 marked it as one of the worst-performing plants, requiring heightened oversight, and is one step above mandatory shutdown. The redesignation today is the result of the plant resolving over 150 safety violations, including problems with safety standards and security. "At the end of that process, we’ve concluded that they’ve done what they needed to do, they’ve demonstrated sustained improvement at the plant," said NRC spokesman Neil Sheehan. "The issues that caused the plant to put fall under heightened oversight have been addressed." According to the NRC, the plant's redesignation as a Column 1 plant - meaning it will receive just the baseline level of oversight from the federal government - will not change anything about the decommissioning process. The plant is set to close permanently at the end of May, but Sheehan has said that decommissioning is a separate process from regular operation, and therefore the designations would not apply. Entergy has said it was striving to get out of Column 4 before it shut down, to "end on a high note." In its new designation, the plant will receive approximately 5,600 hours a year worth of inspections. This is opposed to the 11,300 hours of inspections Pilgrim received as a Column 4 powerplant last year. Column 4 dedicated special teams of inspectors to review safety and security protocols at the plant, whereas in its new designation, oversight will be conducted mostly by onsight inspectors. Sheehan also said that less inspections will mean some monetary savings for the company, as inspections cost $275 an hour, and the plant has had to pay for thousands of additional inspection hours. Despite the NRC's green light, watchdogs like Diane Turco of the Cape Downwinders organization said she doesn't believe that this new designation means the plant is safer or better performing. "It’s just an indication that the NRC is a lapdog of the nuclear industry, because moving this degrading reactor, operated by Entergy, up to Column 1 is just a checklist and nothing more," Turco said.